I really like the bright blue paint that I mixed up for yesterday's painting so I decided to mix up some more! There's something about the dark contrast that really brings out the reds in the boat's reflections. 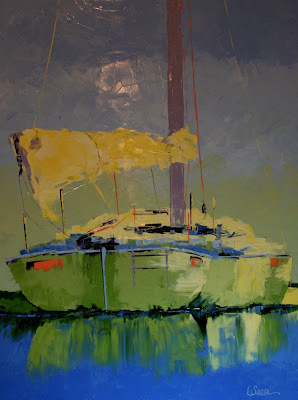 I am painting larger paintings next week so it is fun to try the different color combinations. We are so lucky as artists ... that we have the liberty to paint whatever we want! "Artists Helping Artists" - I just signed up for a free conference call service that allows 240 callers to participate on a conference call (for free). My intent is to host bi-monthly "Artist Helping Artists" conference calls. Anybody can call in, the purpose of the call is to share ideas and for artists all over the country to participate! I will post the date, call in time, etc. tomorrow on my blog, but let me know your thoughts. I have some ideas for topics but please post suggestions here! Thanks! Oil, 14" x 11", Oil on canvas panel. Today was one of those days that started out busy and then it all came to a grinding halt! I had two exhibitions that I needed to enter and I decided to get them emailed off early, which is unusual for me. Usually I paint in the morning and then I tend to the "busy work" in the afternoon. I also had to ship off a painting to Ironstone Vineyards for their exhibition. I finished that too. Unfortunately when I got home from the post office I realized that rain had caused another power outage in our neighborhood. Since this one lasted from 2:00 p.m. until 9:30 p.m. I couldn't find enough light to paint. The dark clouds outside just made my studio very dark! So, no time to paint today! I am posting a painting that will be featured tomorrow at the South Pasadena "Meet the Mayor" Reception. 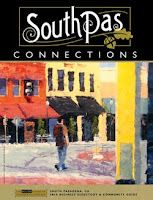 The painting was selected for the cover of the South Pasadena Chamber of Commerce Connections Annual Catalog. My husband and I spent the weekend up at Stanford watching our son swim in his first Pac-10 meet. It was so much fun and I still can't believe he is swimming in college! I will be busy for the next six weeks finishing paintings for my upcoming gallery show titled "Headlines". The show opens on April 28th and will be held at the South Pas Gallery. The show will feature 25 paintings which will were all inspired by headlines from past issues of the South Pasadena Review, our wonderful small town newspaper. The displayed paintings will include copies of the newspaper headlines and articles that inspired each painting. I promise to post the paintings on my blog and website as soon as the show opens! I had a hard time photographing this today. I am sure you have heard about the rains in Los angeles. Apparently we had a tornado here too today. The painting was too big to put in my light box so this photo will have to do for now. It has been raining nonstop for the last 24 hours and it isn't supposed to stop for at least five days. That is very unusual for Southern California but we do need the rain. Of course we are supposed to film a commercial at our house tomorrow. So that means there will be about 60 people here bringing the mud in to the house ... oh no! It's been a very busy weekend with baseball and volleyball games all over town. But it finally started raining (and they are predicting tons of rain this week) so this is a perfect time to paint! Sales have been amazing these past few days (sold three paintings on Friday, one yesterday and one today) so I really need to get to my studio. Enough said! "Waiting On a Sunday Morning"
I liked the colors from Monday's post so thought I would try another painting using a similar palette. I used the same size canvas as well, just turned it the other direction. I received some good news this week. 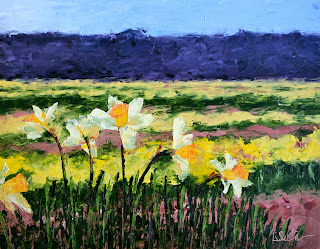 My painting "Field of Daffodils" was accepted in to the Ironstone Vineyards "Spring Obsession" Show and my painting "Leaving the Winery" was accepted in to the Pasadena Society of Artists 85th Annual Show at Viva Gallery. I guess it just goes to show you that being organized actually pays off (see post from Tuesday, January 7th)! Oil, 16" x 8" on canvas panel. I do have quite a few entries for competitions to paint. Most are landscapes, i.e. city scenes. I will be doing a few Stanford and Palo Alto paintings in the next week so stay posted! The title of this painting has a special meaning to me. My maiden name is "Byrd" and I am one of five children, placed right in the middle. When I was growing up I made it well know known that was the "neglected middle child". This was, of course, a complete joke. I grew up in an incredibly loving family and I still consider my siblings as my closest friends. As a kid I was given every opportunity imaginable ... ballet lessons, tap lessons, jazz lessons, singing lessons, acting lessons, piano lessons, sewing classes, cooking classes, ayso soccer, swim team, basketball, volleyball and high jump! Needless to say, I was a far cry from the "neglected middle child". When I saw this painting I knew had to paint it. I did, however, take the liberty of changing the backwards "middle bird" to a bright red instead of a very pale off-white! So ... did anyone notice that with all those lessons I took when I was a kid ... none of them were art lessons? I kind of went "outside of the box" on this one today and painted a very different subject matter than usual. But it's the new year, and time to try different things every once in a while. 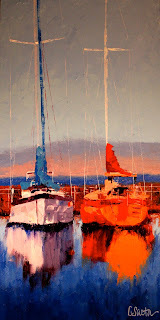 It was fun, but I will probably be back to painting boats very soon, so no worries! I have also signed up for periodic emails that send updates about upcoming shows. Whenever I see a competition that sounds interesting, I print the prospectus, enter the submit deadline on the calendar and put the backup information inside the file. I put the current calendar in a file so it stands up on my desk (and stares at me all day)! Every week I go through the files for the current and following month and put post it notes with the names of the paintings that I intend to enter. I also keep track of paintings that I need to finish for upcoming exhibitions. When I send off the entries I check them off on the calendar and then add the notification date to the calendar. I would love any other suggestions or "improvements" to my system. I hope this is helpful to some of you! I posted this painting awhile ago and the photograph quality was terrible. I had to photograph it at night and it didn't come out well. So I retook the photo today I am much happier with this one! I finished a painting tonight that I had hoped to post but I think I will wait until tomorrow to photograph it in the day light. I was back at the apple store today getting tips on resizing photographs. I had an entry for a competition that had to be postmarked today and needed some pointers for my new mac. I also took an hour class on using the "iphone for Business" and they gave a great tip. There is a free App called "Dragon Dictation" which allows you to "speak" into the phone for emails and texts. For those of you that try to get business done in the car, this is a great and safe alternative! I am sooo sorry that I haven't posted a new painting in a while. But I have been so busy getting organized with my goals and starting off the new year that I haven't had much time to paint. I know it is a lame excuse but I am in that "nesting stage" where I want to be ready for the year before I dive back in to my studio. I have been working a lot on my website, in fact I was at the Apple store this morning at 7:00am for a tutoring session. I added a page to my website that now offers all of my notecards. I have been sending them out with all of my sold paintings and finally built up an inventory so they are for sale here on my website. I sold 20 today! I am just about done with my January newsletter and I finished my new filing system that will enable me to FINALLY keep tack of exhibition jury deadlines! I hope I am not getting carried away because it looks like I am going to enter six competitions this month. I might need to change my goal for the year ... since it was only ten! I also made the leap and decided to offer my paintings on Imagekind. I think it is a nice way to expand my art into the corporate world as framed prints of my artwork are a good alternative for businesses and offices. I just about have that completed so click here for more information. I am also starting an art class tonight with Jennifer McChristian. She is an amazing painter and I am really hoping to learn a lot from her. I absolutely love her paintings! I will be back in the studio in the next few days, I promise!